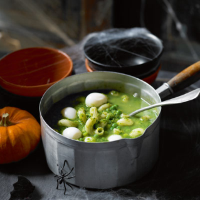 Hubble, bubble, toil and trouble... the witches have been busy with this thick green soup, floating with eyeballs and worms (well, quail's eggs and pasta!) Good thing it’s so delicious. 1. Melt the butter in a saucepan. Add the salad onions and fry for 3 minutes. Reserve a handful of the peas and add the remainder to the pan with the stock. Bring to the boil, reduce the heat and simmer very gently for 10 minutes. 2. Meanwhile, bring a small saucepan of water to the boil, add the pasta and cook for 5 minutes or until tender. Remove the pasta with a slotted spoon to a plate. Add the quail's eggs to the water and simmer for 2 minutes. Drain and when cool enough to handle, peel away the shells. 3. Add the spinach to the soup and cook for 2 minutes. Use a hand blender or food processor to blend the soup until a coarse purée. Heat through then scatter the pasta curls on top. Rest the quail's eggs on the surface and sprinkle with the reserved peas.